1 of 3 In a small bowl, stir together broth, soy sauce, cornstarch and oyster sauce. Set aside. 2 of 3 Heat 1 tablespoon of the oil in a large nonstick skillet or wok over medium-high heat. Add shrimp and cook for 4 minutes, turning after 2 minutes. 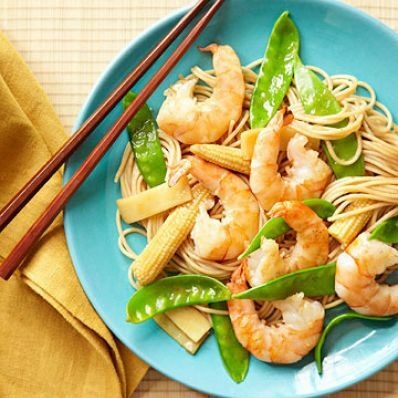 Remove shrimp to a plate and keep warm. 3 of 3 Add remaining tablespoon oil to skillet and add snow peas and ginger. Stir-fry for 2 minutes. Add bamboo shoots, corn, broth and soy sauce mixture. Simmer for 2 minutes, until thickened. Stir in shrimp and cook until heated through, about 1 minute. Serve over cooked spaghetti. Per Serving: 36 g pro., 466 kcal cal., 807 mg sodium, 12 g fiber, 1 g sat. fat, 172 mg chol., 9 g Fat, total, 60 g carb.